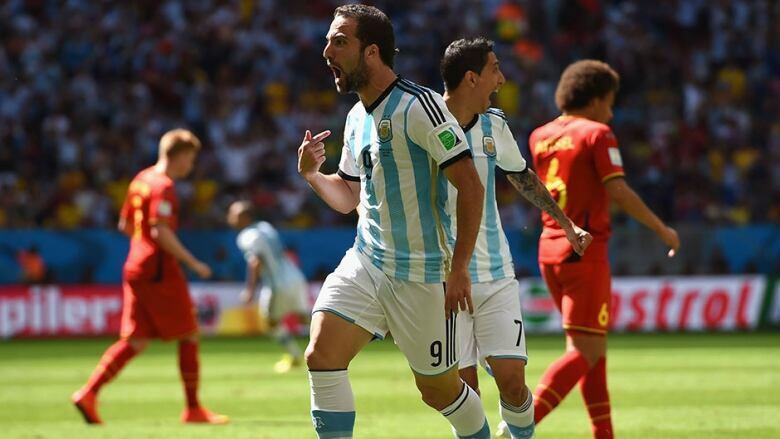 Gonzalo Higuain scores in the eighth minute as Argentina books its spot in the World Cup semifinals with a 1-0 win over Belgium, Saturday at Estadio Nacional in Brasilia. Gonzalo Higuain's goal in the eighth minute stood as the winner and Argentina booked its spot in the World Cup semifinals with a 1-0 win over Belgium, Saturday at Estadio Nacional in Brasilia. Argentina hasn't made it as far as the semis since 1990 when the two-time champions lost to West Germany in the final. Higuain, 26, took advantage of a lucky bounce on his goal. He ripped a spectacular seeing-eye shot to the corner off the bounce to give his team the early lead. The ping-pong effort was his first goal of the 2014 tournament. Higuain nearly had his second of the match in the 54th minute after beating Belgium captain Vincent Kompany between the legs, but ripped a shot off the crossbar. Higuain's goal less than 10 minutes into the match essentially had the Belgian attack waffling for the entire first half and sealed their fate almost before they took to the pitch. Higuain was the driving force behind Argentina's win after a slow start to the 2014 tournament, not only producing the lone goal but creating another great chance in the second half. Relief? Yep. Three shots on target for both teams combined is the lowest total in a World Cup knockout match since the 1990 final. The Argentine back line. An often underestimated group, they epitomized the bend but not break philosophy. Argentina coach Alejandro Sabella. Or was it a good day? He nearly had what appeared to be a heart attack after Higuain's near-miss in the second half. But he didn't, we don't think...nor did he fall over. "We've seen the experience of Argentina, they can distort rhythm, it takes 30 seconds to take a throw in, the referee does nothing so they can break our rhythm and speed," Belgium coach Marc Wilmots said. "We were not impressed by the Argentines, absolutely not, it's just an ordinary team." "Since the first game of this World Cup I said I was calm, that the goals would come. It came and at an important moment," Higuain said. "It's been so many years since we made it to the semifinals. Now we did." Argentina's last World Cup title came in 1986, and it hasn't made it this far in nearly a quarter century. Lionel Messi's legend will continue to grow if he can guide his country to the final and beyond. Will he replace Diego Maradona in Argentine folklore? Argentina will play the Netherlands in the semifinals on Wednesday (CBC TV, cbc.ca/fifaworldcup, 4 p.m. ET). Belgium has never won the World Cup, although it won the 1920 gold medal when it hosted the Olympics. But this is an excellent showing for the dark-horse Red Devils.